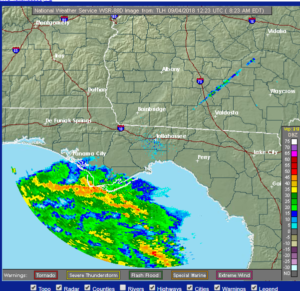 The National Weather Service radar shows TS Gordon impacting the Apalachicola area around 8:30 a.m. Tuesday morning. Tropical Storm Gordon is churning Northwest toward New Orleans Tuesday morning and it looks like southwest Georgia is going to miss most of the storm. As of 8:30 a.m. Tuesday, the projected path still takes the system south of the Florida panhandle. When TS Gordon does make landfall, it will be the second time – the southern tip of Florida’s peninsula was impacted by the storm Monday before it made it’s way into the Gulf. Showers and thunderstorms likely, mainly after 2pm. Cloudy, with a high near 88. East wind around 10 mph. Chance of precipitation is 60%. New rainfall amounts between a tenth and quarter of an inch, except higher amounts possible in thunderstorms. Showers and thunderstorms likely, mainly before 8pm. Mostly cloudy, with a low around 74. East wind 5 to 10 mph. Chance of precipitation is 60%. New rainfall amounts between a tenth and quarter of an inch, except higher amounts possible in thunderstorms. A 30 percent chance of showers and thunderstorms, mainly after 2pm. Partly sunny, with a high near 90. East wind 5 to 10 mph. A 30 percent chance of showers and thunderstorms before 8pm. Mostly cloudy, with a low around 74. East wind around 5 mph becoming calm. A 30 percent chance of showers and thunderstorms, mainly after 2pm. Partly sunny, with a high near 91. East wind around 5 mph. A 30 percent chance of showers and thunderstorms, mainly before 8pm. Partly cloudy, with a low around 72. A 30 percent chance of showers and thunderstorms. Mostly sunny, with a high near 91. Mostly cloudy, with a low around 72. A 40 percent chance of showers and thunderstorms. Partly sunny, with a high near 90. A 20 percent chance of showers and thunderstorms. Mostly cloudy, with a low around 73. A 30 percent chance of showers and thunderstorms. Mostly cloudy, with a low around 72. WEATHER: Rain, Warm Weather and then a Cool Down?